PwC, the accounting firm responsible for tabulating Oscar ballots, has apologised for an "error" in the announcement of the best picture award. 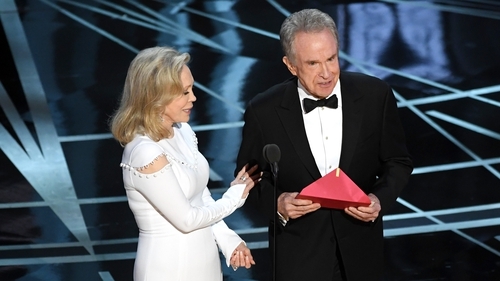 PwC admitted that Warren Beatty and Faye Dunaway were handed the wrong envelope. The embarrassing mix-up saw the Oscar incorrectly given to musical "La La Land" before the actual winner, coming-of-age drama "Moonlight," was finally handed the prize. "We sincerely apologise to 'Moonlight,' 'La La Land,' Warren Beatty, Faye Dunaway, and Oscar viewers for the error that was made during the award announcement for Best Picture," the company said in a statement. "The presenters had mistakenly been given the wrong category envelope and, when discovered, was immediately corrected," it added. "We are currently investigating how this could have happened, and deeply regret that this occurred," it said, hailing the "grace" with which all concered handled the situation. The mistake made for a chaotic end to the film industry's biggest night, on which "La La Land" went home with six awards including best director, actress, score and song, to three for "Moonlight."